Jack's family life began crumbling early in his childhood. When Jack and his brother Wade were four and five years old, Jack's mother walked out on the family due to severe depression. Later in his youth, their father died in a hunting accident. Not long after that, Wade disappears. Jack is left to run their apple orchard by himself. Jack marries a neighbor, LeeAnn and after eight years of infertility, their marriage falls apart. Then, Wade returns along with his new job at Green Energy with hopes to reconcile his past and help out the town. Wade is selling land leases for Green Energy to frack for natural gas in the abundant shale deposits of his hometown of Minden, Pennsylvania. The quick money is a big draw for many of the families and businesses who have seen their town dwindle since the coal companies left. However, Jack is worried about the effects of fracking on the land, his orchard and LeeAnn's organic apple trees. He makes the decision to call in his mother, Stella, now an acclaimed environmental lawyer to get some perspective on the issue. With Wade, Jack and Stella all back together there will be more be more explosions than just the hydraulic fracturing. As an environmental scientist, I appreciate pertinent environmental issues featured in contemporary fiction. The Promise of Pierson Orchard expertly incorporates the slowly leaking and infiltrating toxins of the hydraulic fracturing with the disassembling relationships within Jack's family. The characters are definitely the focus of the story. The writing switching between the point-of-view of Jack, Wade, LeeAnn and Stella giving an intimate look into each character's back story and reasoning, making it easy to see everyone's beliefs and why they were convinced they were doing the right thing. The shorter chapters also made for quick reading and a build of suspense as secrets were revealed. I was most impressed with the author's ability to come up with a compromise solution for the town and the hydraulic fracturing. 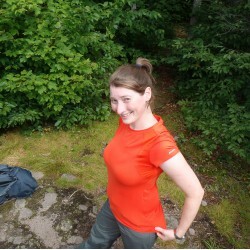 While the dangers of fracking and its many consequences are highlighted, Stella's character is able to come up with a solution that includes fracking done a better way in order to help the community and family that she left behind. 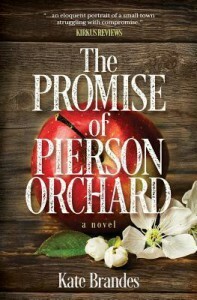 With a heart-pounding and surprising ending, The Promise of Pierson Orchard provides an engaging and thoughtful read.